The arrival of cloud storage is changing not only how we share files personally, but also professionally. Now the business world is likely to be even more shaken up seeing as on Monday, July 16, Microsoft CEO Steve Ballmer released a preview version of Office 2013 and its cloud-connected cousin, Office 365, at a media event in San Francisco. This is timed nicely with the upcoming launch of Microsoft’s newest operating system, Windows 8, in October. The company's next-generation office suite appears to be tightly focused on mobile devices, touchscreens, and the cloud. Like Windows 8, both Office 2013 and Office 365 represent a significant departure from their predecessors. Microsoft has changed features large and small in the revamped suite, with the stated goal of streamlining productivity and embracing mobility. With a flat, minimalist design and genuine desktop application, Office 2013 looks rather different from previous versions. Microsoft has integrated Skype, SkyDrive, and even the social service Yammer into the programs, making the entire suite much more touch friendly. The now-familiar “ribbon” interface is carried over from Office 2010, but you can hide it from view to maximize the screen real estate available on smaller displays. Each component of the suite --Word, Excel, PowerPoint, Outlook, and the rest-- has received new features. As it has done in the past, Microsoft will offer consumers and businesses several disc versions of Office 2013 that can be installed locally on a computer. However Microsoft also plans to market its Office 365 subscription service to both consumers and businesses! So subscribers will be entitled to download and install Office 2013 on up to five devices, including PCs and tablets running only on Windows 7 and Windows 8. 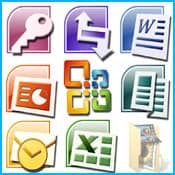 So don’t forget to upgrade to Microsoft Office 2013 once it arrives and see if your business will thrive with these exciting developments from the office software pioneer! A preview version of the new Office suite is being made available online at http://www.office.com/preview. Details regarding price and the exact date of release will be issued in the fall, so stay tuned!